The Lord of the Rings: The Fellowship of the Ring is a 2001 fantasy adventure film directed by Peter Jackson based on the first volume of J. R. R. Tolkien's The Lord of the Rings. Set in Middle-earth and filmed entirely in New Zealand, the story tells of the Dark Lord Sauron, who is seeking the One Ring. The Ring has found its way to the young hobbit Frodo Baggins (Elijah Wood). The fate of Middle-earth hangs in the balance as Frodo and eight companions form the Fellowship of the Ring, and journey to Mount Doom in the land of Mordor: the only place where the Ring can be destroyed. Released on December 19, 2001, the film was highly acclaimed by critics and fans alike. It was a major box office success, earning over $870 million worldwide and is the 17th highest-grossing film of all time. It won four Academy Awards and five BAFTAs. On the 40 cent stamp is Gandalf the Grey (Sir Ian McKellen) - an Istari wizard and mentor to Frodo, who helps him decide what to do with the Ring. Saruman the White (Christopher Lee) - is the fallen head of the Istari Order who succumbs to Sauron's will. 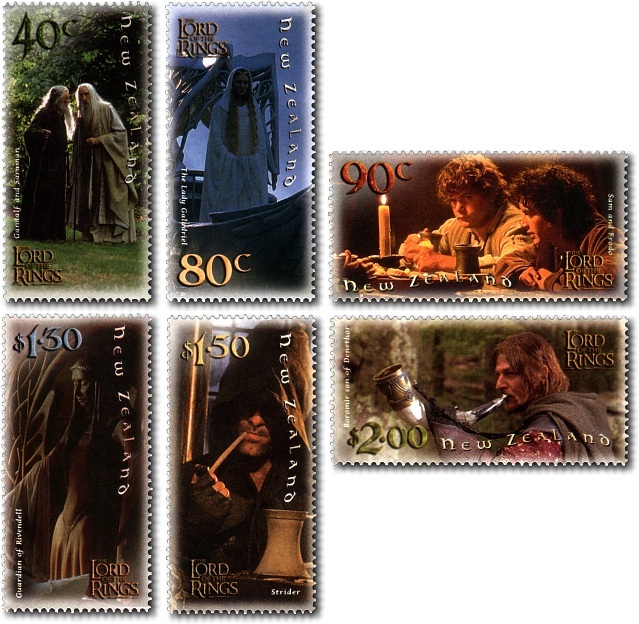 The 80 cent stamp has Galadriel (Cate Blanchett) - an Elf and the co-ruler of Lothlorien with her husband Lord Celeborn. She shows Frodo a possible outcome of events in her mirror and gives him the Light of Earendil. On the 90 cent stamp is Frodo Baggins (Elijah Wood) - a hobbit who inherits the One Ring from his uncle, Bilbo Baggins. He is mostly accompanied by his best friend and fellow hobbit, Samwise "Sam" Gamgee (Sean Austin) - a Hobbit gardener and friend of Frodo. When caught eavesdropping, Sam is forced to become Frodo's companion and from then on becomes very loyal. The $1.30 stamp has the Guardian of Rivendell who brings Frodo back from the brink of death. The $1.50 stamp shows Aragorn "Strider" (Viggo Mortensen) - a Dunedain ranger and the heir to the throne of Gondor. He travels with the Fellowship on their journey to Mordor and is unsure of whether to become King following the failure of his ancestor, Isildur, to destroy the Ring. This self-doubt is a significant addition to the movie and is not present in the book. It was added because Peter Jackson believed that every character must grow or learn something over the course of the story. The $2 stamp has Boromir of Gondor (Sean Bean) - a prince of the Stewards of Gondor who journeys with the Fellowship towards Mordor although he is tempted by the power of the Ring. He feels Gondor needs no King, but becomes a friend of Aragorn. 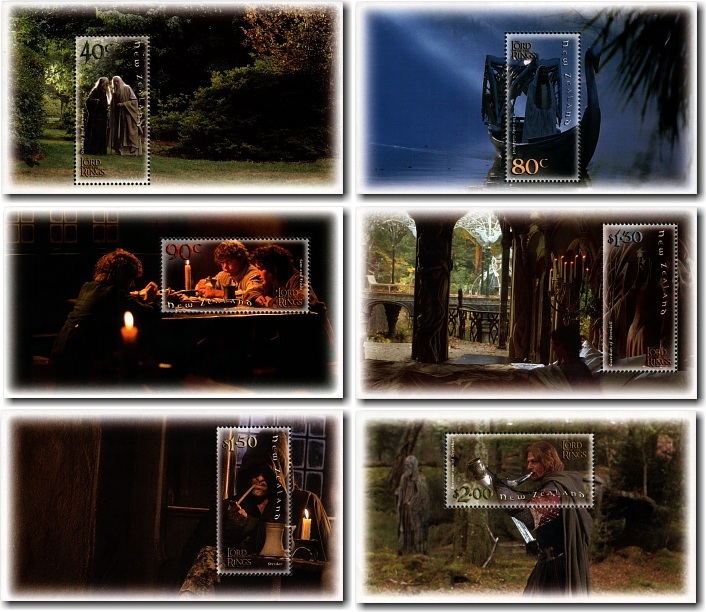 A set of six miniature sheets were also issued showing each stamp in this issue in the context of the rest of the frame from the movie.